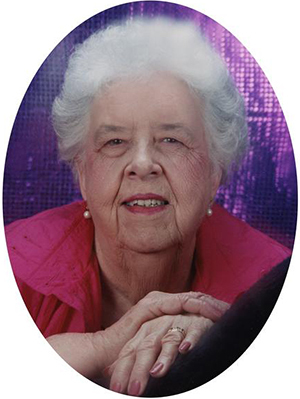 Obituary – Ashbrook, Aley Nellie (Elgin) « Perry High School Alumni Association, Inc.
Aley Ashbrook, 83, of Perry, Oklahoma, was the daughter of Monroe and Nora Nellie Crowe Elgin. She was born on June 26, 1926 in Perry, Oklahoma and died Saturday, April 3, 2010 at Green Valley Nursing Home. She was a 1945 graduate of Perry High School. On June 10, 1946, Aley married Walter Ashbrook in Independence, Kansas. He preceded her in death on May 12, 2001. Aley was a member of the First Presbyterian Church, the Ladies of 76 Homemakers, the American Legion Auxiliary, FCF, the Grandparents Club and the Jolly 12 Club. She was an Avon representative for 40 years. Funeral services will be 2:00 p.m. Wednesday, April 7, 2010 at the BrownDugger Funeral Home Chapel. Pastor Darryl Bullock will officiate. Interment will be in Grace Hill Cemetery. Services are under the direction of BrownDugger Funeral Home. Memorials may be made to the American Cancer Society or the American Heart Association in care of BrownDugger Funeral Home, 1010 N. 7th Street, Perry, Oklahoma 73077. Aley is survived by one son, Walter Dean Ashbrook and his wife, Virginia, of Claremore, Oklahoma two daughters, Nellie Perkins of Yukon, Oklahoma and Lynda McKenzie of Kirtland, New Mexico one stepdaughter, Shirley Powers of Glencoe, Oklahoma five granddaughters, Alanna Gay and her husband Brian of Clinton, Oklahoma, Vickey Hutchins and her husband John of Yukon, Oklahoma, Deidre Culbert and her husband, Jeff, of Mounds, Oklahoma, Rhonda Stevens of Glencoe, Oklahoma and Sally Cooke of Perry, Oklahoma three grandsons, Mike Andrews of Glencoe, Oklahoma, Lenard McKenzie and his wife, Aurora, of Kirtland, New Mexico and Russell Andrews and his wife Shelly of Glencoe, Oklahoma seven greatgrandchildren and one greatgreat grandson one sister, Margaret Elgin Smith of Perry, Oklahoma and one sisterinlaw, Clara Elgin of Neoga, Illinois. She was preceded in death by her husband, Walter Ashbrook, her parents, Monroe and Nora Elgin, two brothers, Lee Elgin and Pat Elgin and three half brothers, Leonard Milner, John Milner and Ronald Milner.